The anniversary of the nightmare is right around the corner, everyone. This coming Thursday, November 18 is the day 32 years ago when an utterly preventable massacre took place in what history records as the largest single loss of American life in a non-natural disaster. That is, of course, until it was surpassed by the horror of 9/11. 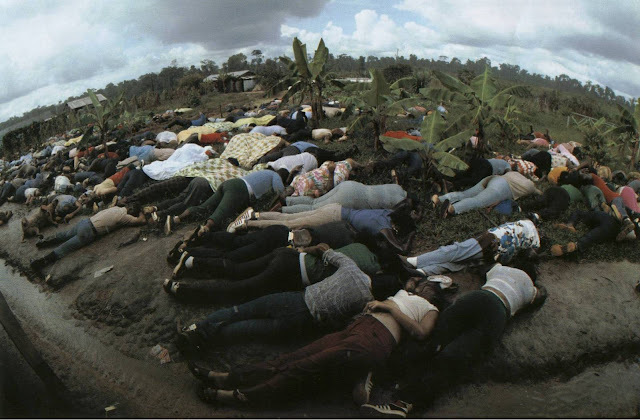 Too many of the culprits that helped pave the way for the Jonestown Massacre are still too gutless and dishonest to make amends, to apologize, or accept any accountability whatsoever. These shameless wonders, the politicians, the journalists, the clergy--and the especially appalling cult apologists--continue hopelessly stuck in a mind-boggling collective state of denial. It's that sad spectacle of what people are reduced to when they have blood on their hands. Then there's the case of some of the surviving members and relatives of the victims of the People's Temple cult, who swim in their own especially deep pool of denial. Five days from now the anniversary memorial service will be held at the same location as all the others: Oakland, California's Evergreen Cemetery, home of the mass grave of 409 murdered men, women, children, and babies. But this year.....something's changed. The survivors and relatives, now bitterly divided into two different factions, can't seem to stand even being at the same service any longer. The first is lead by the Rev. 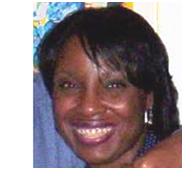 Jynona Norwood, a Los Angeles pastor who lost 27 relatives in the massacre. She's overseen the construction of a Memorial Wall, part of which was unveiled at the cemetery during the service's 30th Anniversary two years ago. But Norwood was emphatic about one thing: When this wall is finally completed, the mass murderer that put her family to death will NEVER be memorialized. "To put Jim Jones's name on that wall is an insult.....to all the dead," declared Norwood at the 2008 service. 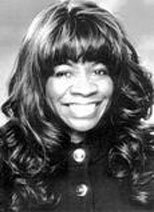 This is not a feeling shared by Lela Howard, who lost an aunt at Jonestown. She and her faction of survivors/relatives (which includes Jim Jones, Jr.) have railed against Norwood, demanding that Jones be memorialized. There's been accusations of financial improprieties in the $100,000 wall project which has left Norwood outraged. 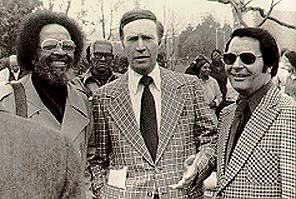 The animosity is now so bad that the two rival camps have arranged for separate services, with Norwood's faction going at 11 a.m. and Howard's at 3 p.m. All of this, not surprisingly, has been ignored by the same local and national media that deliberately covered up the crimes of Jim Jones, empowering him to lay the groundwork for Jonestown. History and its fateful repeat cycle. Something like that. Wasn't it written on a sign once in an extinct pavilion that got swallowed up by jungle? Cult Survivor Laura Johnston Kohl is siding with the Howard faction. "As the years have gone on," she explained recently," I found the peace at Evergreen more and more disturbed by the tone of the 11 a.m. religious service. Its many expressions of anger towards Jim Jones – at the expense of honoring those under our feet – don’t speak to me, just as I believe the traditional Christian service doesn’t speak to my friends who are buried there. After all, while they put the Christian ethic to work – they fed the hungry, clothed the naked, helped care for those afflicted, and tried to rid the world of hate – they had left traditional churches to become activists. In fact, they were 'practicing' Christians, and they practiced that religion day and night. On that day, I determined what I needed for future anniversaries. After many conversations with other survivors and family members, we have come to a consensus about our day. We will begin holding a private, nondenominational gathering at 3 p.m. that same day. It will be the same time each year, on that rolling hillside. In that setting, we can gather and sit quietly or speak – whatever we are moved to do. It probably won’t be a place to lay blame or express hateful diatribes. It will be our time to reconnect and give thought". The Peoples Temple consisted of "practicing Christians"?? When you've finished gasping, try to remember this comes from someone floundering at the very bottom of that special pool of denial where every cult apologist lives. And this place is crowded with swimmers, rest assured. The actual record shows there was just a bit more going on than "feeding, clothing, and caring for the afflicted by these so-called "practicing Christians." Oh, quite a bit more activities, such as fraud, extortion, slave labor, torture, death threats, sexual abuse and, yep, a whole lot of brain washing. "I got in trouble in the church because I lied, and Father (Jones) said I'd have to go to the Blue-Eyed Monster. Then they took me in this dark room, and the monsters were all over the room. They said, " I am the Blue-Eyed Monster and I'm going to get you"....Then a monster grabbed my shirt and tore it open. Then all of a sudden the monsters started to say, "I'm going to get you again‚ and then one hit me right here, she said, pointing to her chest. Then it felt like a knife was going right down to my back, and my body started to shake back and forth like this....Then my teeth were tied together so I couldn't open them....I couldn't believe it--it hurted so bad." This, of course, all took place in California, years before Jonestown, where it evolved into a new torture: "Big Foot," a horrendous series of well-dunkings for the children. Those "practicing Christians." It's just hard to believe how Temple apologists like Kohl can perpetuate this charade. But she and her ilk do. And people are beginning to be taken in by this twisted revisionism. 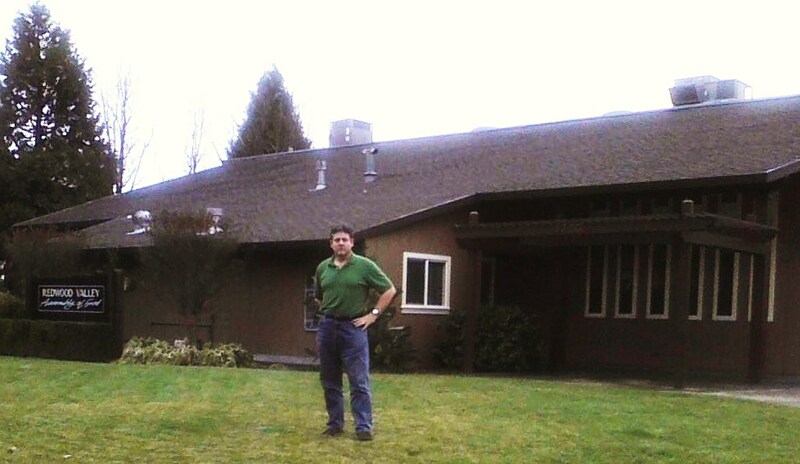 A few years ago, I made a visit to the Redwood Valley church where the crime spree really took off, a place where Rev. Jim Jones first planted his "flock" in California in 1965. I had been brought there by one of the original members of Ukiah's Concerned Citizens group, which had tried so desperately to get help in stopping this growing, menacing cult. No one listened to them, as we now know. And according to our forthright mainstream media, all was well right up to 1977. Today it's the home of an Assembly of God congregation. I didn't get a chance to talk with its pastor. I would have asked him how he felt about preaching in a building that once contained a demon. I looked over the place, the front and back, for a long, long time, trying to imagine the place when my father first went there to interview Jim Jones in 1972 and discover his gun-toting enforcers. 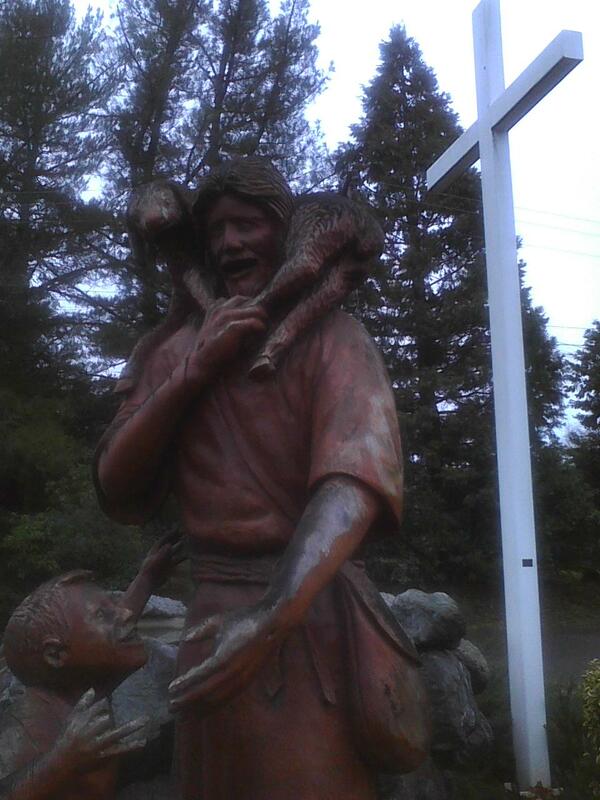 Off to the left side of the church today stands a cross and statues of a smiling Jesus holding a lamb, reaching out to child. I thought of all the children abused and tortured so savagely by Temple members here once. Perhaps this monument was a good way to cleanse that awful karma. It's a poignant sight. The tragedy is how often, still today, religious charlatans are able to put on that smile and deceive a willing public as Jones did. Cults like Scientology thrive because they, like the Peoples Temple, can produce a good enough performance to trap a person in a web, as the spider does a fly. Across from the church building stood a single modest house. Yes, that was where the monster once lived and drew up his plans for destruction. Someone else lives there now but something caught my eye in the flower garden in the front of that house. It was one of the roses. Still with green leaves, it had wilted. The more I looked at it, the more I saw what looked like, well, something grotesque. With horns. I had to photograph it because it gave me an eerie feeling. Made me wonder even futher about karma, maybe a type that remains, manifesting in all manner of shapes and matter. 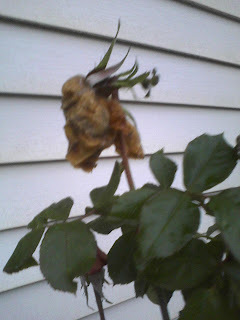 Then again, it was probably just a simple wilted blossom, viewed by someone in a melodramatic funk. Still, that thing in front of Jim Jones's house gave me an uneasy sensation I won't forget. The sensation, however, which I get each and every time November is one of sadness. Frustration. 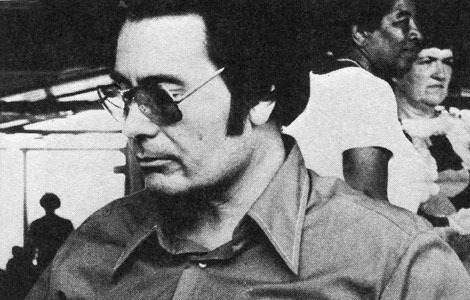 A longing for what could have been, if just only enough people in those high places--a clergyman who suddenly found his conscience or an editor his courage or a politician his morality--acted to stop Jim Jones from his hellish mission. It is, I hope, nothing more than a sick, sick joke. I fear it is worse than that.